As your insurance company will tell you, having a comprehensive visual record of your home’s contents in the event of a fire, natural ­disaster or someone burglarizing your home is one of the best ways to prove that those things were in your home. A visual inventory will speed payment on your insurance claims and likely result in higher payment because you have a more detailed and comprehensive tally. You can use any still camera or video camera, including your cell-phone camera, shooting a mix of video and stills. It is a good weekend project, working a few hours per day. Shoot exterior views, either still or video, to demonstrate the “before” condition of your home and your landscaping. First take an “establishing” shot that shows the home and surroundings. Then take individual shots of expensive items such as barbecue grills, lawn furniture and exterior lighting fixtures. Then head into your garage or shed to shoot yard tools and equipment such as mowers, snowblowers and generators. Anything you can move to the driveway, such as your car or bicycles, can be shot there. Shoot an overall shot of each room on video, and then create a record of items with still photos. Document individual items. Expensive items such as electronics, jewelry and collectibles/antiques should be photographed individually and from various angles. With electronics, be sure to show brand and model. Open drawers (your silverware drawer, for instance) and jewelry boxes to show the contents. If you collect books, shoot wide views of each bookshelf, then take individual shots of rare volumes. Stamp and coin collections can be scanned on a flatbed scanner—the same one that you use to scan documents for your computer (a simple flatbed scanner sells for between $50 and $100, but many all-­in-one ­printers have a scanning function built in). Create a simple studio. To speed the shooting of small items, make a simple studio space using a sheet of white poster board as a background. I simply tape the poster board to a wall and curve it down to the surface of a card table to make a seamless background. 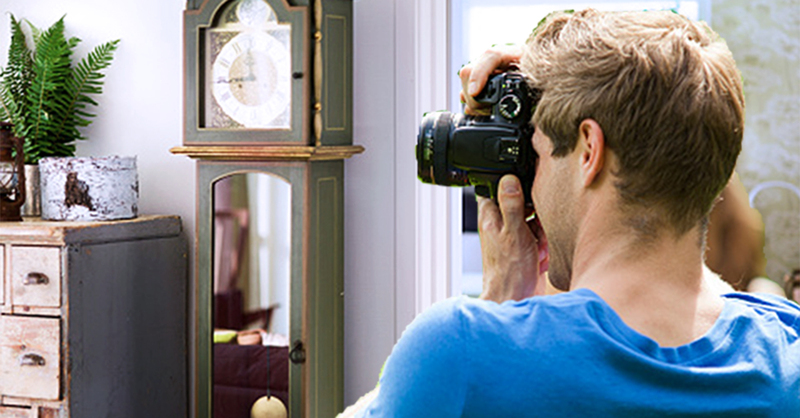 Use light from a nearby window or simple desk lights or your camera’s built-in flash. Don’t forget closets. Take wide views but also include individual shots of designer items (and labels). To get a good shot, hang an item on the back of a closet door or lay it on a bed. Make copies. Once your record is complete, download all of the videos and photos to your computer and then burn multiple DVD copies (and/or save to the cloud) and store your discs off premises. For free online help: To find software that will guide you through creating and updating a visual inventory, put “Create a Home Inventory” in any search engine.